It’s been three years since we had our epic grand opening at Bela Farm, our rural home for sustainable, land-based Judaism. Since then we’ve developed our apiary and planted 11,000 trees and 4-acres of native wildflowers to nurture the local pollinator communities in Wellington County. This year, our goals are to tend to our trees and flowers AND build Beit Shoresh, our new welcome and education centre! We will have Beit Shoresh up and running for school field trips in fall 2018! We are so excited to spend quality time on the land nurturing the nature that nurtures us and we need your hands, hearts and minds to accomplish our goals. As such, we have carved out 3 weeks in the Shoresh calendar to spend at Bela Farm. 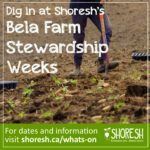 Known as the Bela Farm Stewardship Weeks, our intention is to combine volunteer opportunities with experiential learning to build community and get some good, wholesome work done. You’re invited to come up for a day or stay for a few (if you do stay for multiple nights, bring a tent!). For more information and to RSVP, email sabrina@shoresh.ca. We hope to see you in the fields and hills of Hillsburgh to show some love to the trees and the bees!